A parliamentary report of 1777 recorded parish workhouses in operation at Chagford for up to 20 inmates, and at Sampford Courtenay for up to 30. 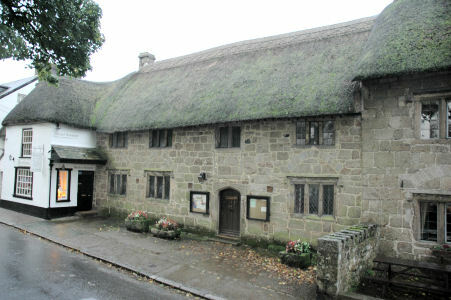 A late 16th century building on the High Street in Chagford (latterly a British Legion Hall) served as a poorhouse in the 19th century. Chagford former poor house, 2005. Devon: Ashbury, Belstone, Belworthy, Bridestow, Bratton Clovelly, Broadwood Kelly, Bondleigh, Chagford (2), Drewsteignton, Exbourne, Germansweek, Gidleigh, Hatherleigh (2), High Hampton, Honey Church, Inwardleigh, Iddesleigh, Jacobstowe, Meeth, Monk Okehampton, North Lew, North Tawton (2), Okehampton (2), Sampford Courtenay, Sourton, Spreyton, South Tawton (2), Throwleigh. Later Addition: Okehampton Hamlets (from 1894). The population falling within the Union at the 1831 census had been 20,844 with parishes ranging in size from Honey Church (74) (population 370) to Okehampton itself (2,055). The average annual poor-rate expenditure for the period 1833-35 had been £9,157 or 8s.9d. per head of the population. 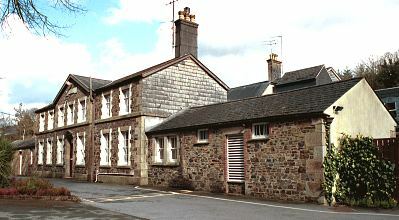 The new Okehampton workhouse was built in 1836-7 at a site on the east side of Castle Road. It was designed by Sampson Kempthorne who was also the architect for other Devon workhouses at Axminster, Barnstaple, Crediton, Exeter, South Molton, and Torrington. The workhouse location and layout are shown on the 1904 map below. Okehampton used Kempthorne's "200-pauper" design — a cut-down version of his standard cruciform plan and lacking a supervisory hub. This design was devised for areas with relatively low pauperism. The entrance and administrative block faced to the north-west. This would have contained Guardians' board room, porter's room, and offices for the Union's clerk and relieving officer. Okehampton entrance block from the west, 2001. The main accommodation wings were of two storeys. Various single-storey utility rooms and workshops formed the perimeter of the building. Okehampton from the north, 2001. In 1894, the British Medical Journal set up a "commission" to investigate conditions in provincial workhouses and their infirmaries. Following a visit to Okehampton, the commission's report made a number of criticisms regarding such matters as: the "comfortless and bare" appearance of the sicks wards and dayrooms; the poor kitchen and laundry facilities; the absence of children's chairs, toys or picture books in the nursery; and the lack of suitable play areas for the older children. The report also questioned the decision that a recently appointed nurse should be required to bathe and attend to female vagrants and thus expose herself to the danger of disease and infection. The commission's conclusion was that the existing workhouse was "so old and so faulty in construction" that it needed to be rebuilt, preferably on a different site. Further details are available in the full report. Following the BMJ's condemnation of the institution, and particularly, the sick wards, the Guardians decided against building a completely new workhouse. Instead, in around 1900, a new infirmary and casual wards were erected, and a number of other alterations and improvements were made. In February, 1900, the workhouse grounds were laid waste when the adjacent West Okement river overflowed. The workhouse building itself was undamaged however. After 1930, the former workhouse was taken over by Devon County Council and became a Public Assistance Institution. After 1948, it became the Castle Hospital, latterly providing geriatric care, until its closure in 2004. After an unsuccessful local effort to get the building listed, it was demolished in 2008. Modern housing now occupies the site. Devon Heritage Centre, Great Moor House, Bittern Road, Sowton Exeter EX2 7NL. Holdings include: Guardians' minute books (1836-1927); Outdoor relief lists (1853-1914); Various committee minutes.